Kate: Hi, I'm Kate O'Keeffe, Senior Director in charge of the Cisco CHILL program—CHILL stands for Cisco Hyper Innovation Living Labs. Stephanie: What is CHILL working on right now? Kate: CHILL is responsible for driving industry-wide innovation with our customers. We focus on zones where we think Cisco shares opportunities with some of our largest customers. 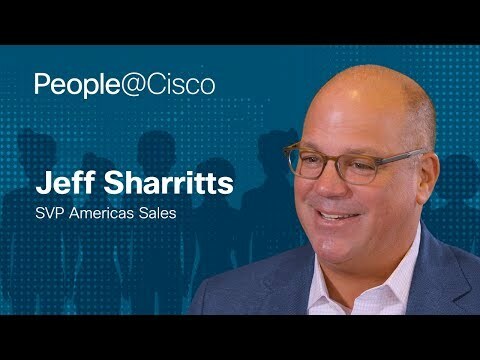 We take these new emerging trends and create cohorts of Cisco customers that join us on a journey to drive disruption in that space. We had a lot of great outcomes out of our Living Lab we did on Securing the Digitized Supply Chain Powered by Blockchain. We are continuing to drive four of the five concepts that were pitched as part of that living lab. The next living lab focuses on the future of work. In particular, we'll be focusing on augmenting the worker of the future. We're working across Cisco, Cisco IT, Human Resources, and we're bringing together a cohort of Cisco's largest customers. Stephanie: Tell me about working from home. Kate: I live in an old San Franciscan Victorian—it was built in 1912 as part of the wave of building after the 1906 earthquake. I sit here in front of a traditional Victorian bay window which get tons and tons of natural light. I became the mother of twins last year. Working from home gives me enormous flexibility and capacity to be a mom and to be here with my boys. Stephanie: Where are some other places you find yourself using as a workspace? Kate: I work in all of Cisco's offices across the Bay Area. I also use third spaces, so cafes and the like. I'm from a town in Australia called Melbourne, and everyone who lives in Melbourne is a coffee snob. This cup of coffee is from my favorite cafe in the universe, it's a place called The Coffee Shop. It's run by a guy who was a Zen monk in Japan for ten years and he decided to leave that behind to make the perfect cup of coffee. He decided that was the best way for him to serve society. And that idea, him and his perfect gesture, is an idea that is the root of some of my philosophies about the contribution you can make. It's why I drink his coffee and that café is somewhere you can find me. Stephanie: So what is on your desk? My Dx80 is important to me, I have a lot of great conversations here in my bedroom. People enjoy looking at the photographs of my babies in the background and asking how they're progressing. When we run the Living Labs, we assemble groups of investors who are usually executives from across the broader corporate cohort. At the end of those pitches they'll raise that paddle to say they're in, that they're behind the idea. It reminds me, I believe we succeed or fail in life one conversation at a time. We're always pitching, we're always framing up, and this reminds me that's a part of everyday, not just a lab day. This is actual work, not a prop—I am in the middle of preparing for our next comic book blog that addresses some of the issues around the future of work. This will revolve around how workers will be, some challenges about interfacing with robots, artificial intelligence, and security issues. We're building this comic book series to help folks think deeply about the challenges for those imagined futures. We're helping people conceive a future to be better innovators in that space. I think that's a really important part of me personally but also in my capacity to be creative. I'm a big David Bowie fan. David Bowie is a great artist, conceptual artist, and designer, and this is an example of something I'm likely to draw inspiration from. I'm a bit of a Star Wars fanatic. I walked down the aisle to the Star Wars theme played by a brass band. I'm a huge fan of the Golden Gate Bridge, I was married overlooking the Bridge a couple of years ago. Godzilla is a reference to my comic book background. I worked briefly for Cisco's Kip Compton and he had a Christmas gingerbread competition, and I bought the Godzilla so I could smash his gingerbread house and just place that in its stead. This book is all about great women superhero characters in comic books and how the role of women have changed in comic books over the years. It collides many topics of interest of mine, women, women in popular culture, comic books, and how we use them to drive imagination. Learn more about Cisco's CHILL here.